Balluff's new Advanced SMARTLEVEL capacitive sensor enables the ability to sense solids and highly conductive acids and bases with the utmost reliability. Balluff's advanced SMARTLEVEL sensor is ideal for level detection applications involving liquids, powders, granulates, paste like medias, such as grease, cleaning fluids, and acids and bases. 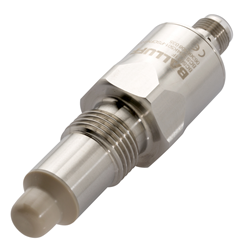 Balluff’s state-of-the-art, industry leading line of capacitive sensors newest member is the Advanced SMARTLEVEL. This sensor combines standard capacitive sensing technology and the patented SMARTLEVEL technology enabling the ability to sense solids and highly conductive acids and bases with the utmost reliability. The Balluff Advanced SMARTLEVEL is housed in 316 stainless steel for the most aggressive environments. The PEEK sensing nose will provide protection against sticky and adhesive materials. This combination of housing materials gives the sensor an IP69 rating and is suitable for use in autoclaves for one hour. When used with the proper mounting accessories the sensor can be used in hygienic applications. Integration into control systems is fast and flexible with either discrete outputs or with IO-Link communication. Teaching the Advanced SMARTLEVEL without IO-Link is easy with the remote teach-in connection or with parametrization through IO-Link. The Advanced SMARTLEVEL is ideal for level detection applications involving liquids, powders, granulates, paste like medias, such as grease, cleaning fluids, and acids and bases. Download the high resolution photo on Flickr.